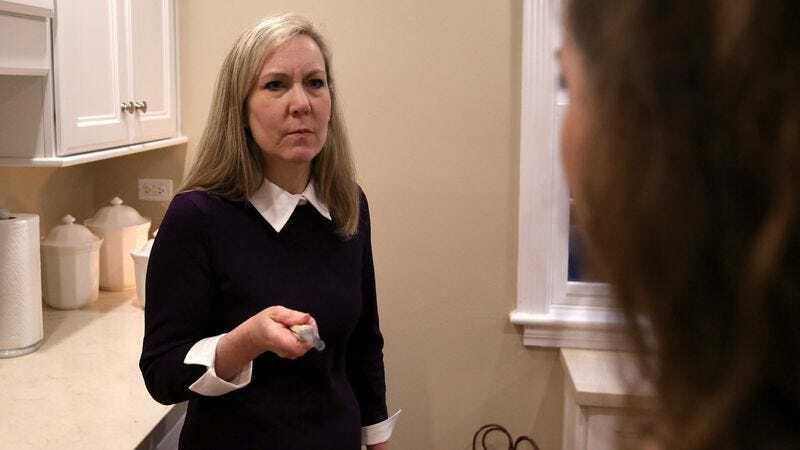 TOLLAND, CT—Responding with lightning-quick reflexes to her dinner guest’s proposal, area mother Linda McGregor reportedly grabbed a 10-inch chef’s knife Thursday night and held it up to the throat of family friend Diane Wallace following her offer to help with the dishes. “Say one more thing about clearing the table or putting the dishes in the dishwasher, Diane, and I’ll gut you like a fish,” said the 56-year-old, intently staring into Wallace’s eyes as she pressed the blade just firmly enough against the woman’s neck for it to draw a single bead of blood. “Pour yourself another glass of red wine and just forget all about these dirty plates, the used silverware, or any of the pots and pans. Because if you even so much as step foot in the kitchen while I’m cleaning up, the next thing you’ll see—the last thing you’ll see—is me slicing you open from head to toe. Got it?” Sources confirmed McGregor later plunged the knife deep into her husband’s chest when he asked her if she would leave the dishes for later and join the rest of the party for a game of Scattergories.